Preheat oven to 350 degrees. Spray Pam for baking into a bundt pan. 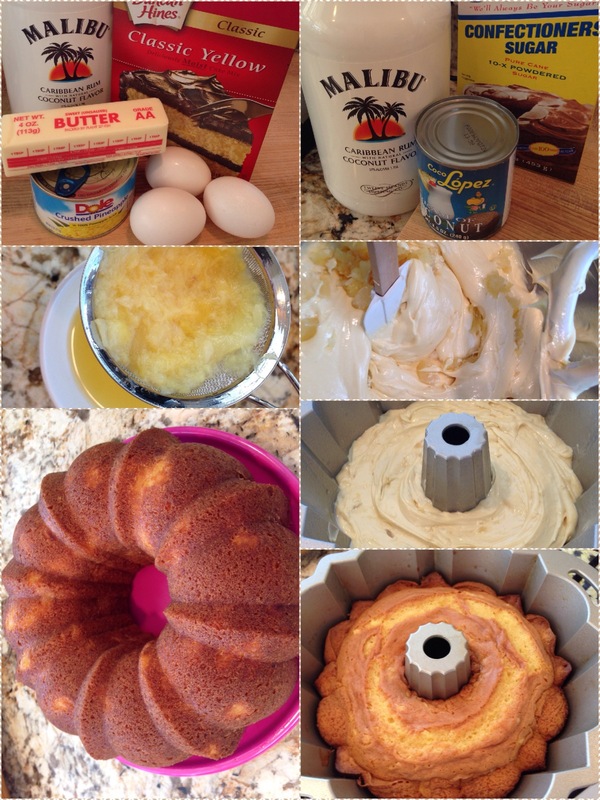 Using an electric mixer, combine cake mix, butter, eggs, 1/4 C reserved juice and 1/4 C Rum, beat at low speed to combine. Beat at medium speed for two minutes. Fold in drained crushed pineapple. Pour batter in prepared pan Bake 33-36 minutes or until toothpick inserted comes out clean. While cake is baking, prepare glaze. Shake cream of coconut can well before measuring. Add cream of coconut to small saucepan and heat just until bubbles form. Remove from heat and stir in rum. Set aside. When cake is done baking, set on rack. Use a thin bamboo skewer to poke holes in cake. Pour half of glaze over warm cake, letting it soak in. When cake is cool, turn onto serving plate. Whisk together remaining glaze with confectioner’s sugar until smooth and drizzle over top of cake.